Home → Articles → New Packaging: What is the point? There is always a number of valid and reasonable factors which inform or influence changes in packaging of medicinal (and other) products. 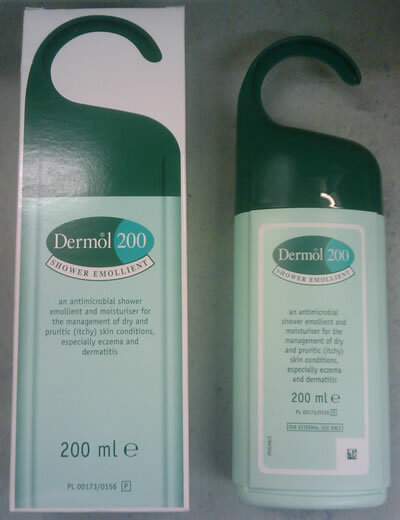 We scratched our head to find a justifiable reason why the packaging of Dermol 200 shower gel (pictured) had to change. On the right is the previous packaging, and on the left is the new packaging. The obvious difference between the two is that an extra layer of packaging has been added and an information leaflet inserted. At a time when the wider world is advocating reduction in unnecessary packaging (we are all aware of targets imposed on supermarkets and food manufacturers etc): we ask why was this necessary? We still didn’t get it. So we called Dermal Laboratories (Supplier of product) to check this out. Lo and behold, the change was driven by the MHRA because the Patient Information Leaflet (PIL) that was on the first packaging was of the wrong font size and the only way the manufacturer can accommodate this was to supply the product with a big box around it. We still think this is a bit of an overkill. Unless you can advise us otherwise.